The first part of the final Harry Potter movie held par with it’s predecessors; that is to say, the events that occurred in the book were made into scenes using the films sizable (read: limitless) budget to make these scenes as visually appealing as those in a reader’s imagination. And throughout the Harry Potter movies, the scenes and characters have been impressively visually comparable to those that most had conjured personally while reading Rowling’s brilliant epics. The problem, perhaps, is that beyond charming accents, good casting, and shiploads of money with which to build giant chess sets and convincing dragons, the love with which the books were crafted is completely absent from every film. While Harry Potter in text is as comforting as the vividly described Butter Beer and as thrilling as the suspense filled Quidditch matches, Harry Potter in cinema is more like a really well done action figure - an extremely obvious extension of a multi-billion dollar franchise. The scenes are moved through, the plot points hit, the personalities well matched, and the films are over. Even people who claim to enjoy the movies nearly as much as the books can’t seem to name one stand out event between eight (seven and a half?) movies. Alright, so Hollywood is as much a business as Bill and Bob’s Discount Furniture, and at the end of the day, blockbusters aim to make a buck, but does David Yates have to be quite so obvious about it? At least when he’s playing with the hearts of children.. and teens.. and young twenty somethings.. okay, everyone, because the books are some of the most engaging and unifying pieces of art in creation. No scene seems to take precedence over another, there are no definable climaxes, the soundtrack is nearly non-existent apart from the admittedly good instrumental during the beginning credits, and no event seemed to garner more passionate attention than any other. It’s assembly line film reel, a video game with decent graphics, and more money in the bank. The latest of theseries, Harry Potter and the Deathly Hallows Part I, is as visually gripping as the rest. And, okay, it was fun to see our heroines grow up, but at no point did I feel part of this wizarding world, which at the end of the day, was the most brilliant ability of the novels. The story seems to be told by an outsider, a parent who has heard about the majesty of Hogwarts and the detestability of the Malfoys from an excited kid, and chuckled in appreciation before figuring out how to turn this joy into a business. There were times when I found myself stuffing popcorn into my mouth to avoid screaming at the imaginary man behind the screen committing these egregious creative faux pas. Anyone who’s read Harry Potter knows of the deep attachments you develop to all of the characters, human or otherwise, so when the death and mourning of Harry’s beloved owl Hedwig (spoiler alert..?) is given a total of ten seconds of screen time in the film’s first scenes, you can bet I was doing a lot of chewing. Or when the horrors committed by Voldemort are breezed over in the paper and then discussed with a logic more reminiscent of Law and Order SVU than anything that J.K. Rowling has ever put on paper, I nearly had to excuse myself to use the bathroom. This is the DARK LORD! The murderer of millions and, worse yet, Harry’s PARENTS! Dumbledore is DEAD and Harry is being hunted like a prized quail! I could see the angry kid stomping at his father’s lack of understanding while dad typed down some general notes on these popular books for tykes, to turn into a screen play. Don’t get me wrong, Harry Potter and the Deathly Hallows Part I is not a bad movie. Especially when aided by the glory of a real IMAX theater, but it’s not a memorable one either. Movies that are based on books are always going to have a tough act to follow. Add to this the fact that they are criticized not only for their shortcomings as films, but for their shortcomings as books (which they are not) and, well, it’s an impressive movie that makes the cut. I realize this, and don’t aim to watch Yates’ films with a constant comparison going in my mind. And it's not as though Yates is failing to live up to the directors who've worked on the series before him, all of whom seem afflicted with the same lack of attachment to the story. The issue is that, books aside, any cinematic experience that is going to earn acclaim needs to at least appear as though someone cared about it. 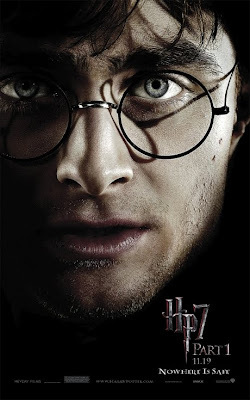 Harry Potter on the screen has not done so thus far, and if by some miracle, Part II of the Deathly Hallows is the final installment that suddenly feels like watching a movie that a director, producer, or screen writer was actually inspired to make, I’ll give it due credit. But so far, so consistent, and let’s just say that the DVDs wont be stacked next to most peoples collection of Rowling’s books in years to come.